Tony Gallagher, City Commissioner of Gallipolis, read the official proclamation Tuesday afternoon honoring those who have given their lives in service of others for National Peace Officers Memorial Day. The honor guard is seen in the background after having paid respects to three fallen officers. GALLIPOLIS — Members of the community gathered together Tuesday to honor those who have lost their lives in the line of duty in honor of National Peace Officer Memorial Day. 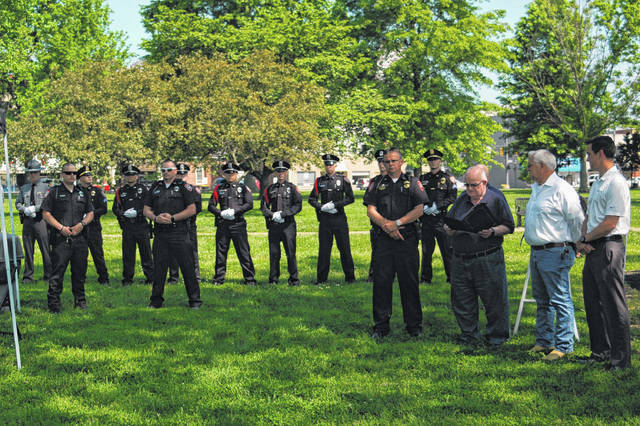 The Gallipolis City Commission along with Ohio Valley Bank and the Gallipolis Police Department held a ceremony in the City Park at noon to commemorate three local officers who lost their lives on duty with a special honor guard ceremony. Dale Holcomb, Dave Poling, and Josh Risner were all memorialized for their sacrifice. GPD, while recognizing those who have made a sacrifice in their death, also looked to those who continue to give in their life. During the ceremony Chief Jeff Boyer named the Gallipolis Police Officer of the Year. Patrolman Chris Walker was selected by his coworkers in the department regarding his honesty, integrity, loyalty, knowledge of the job and how that knowledge is applied. The city commissioners read an official proclamation calling the citizens of Gallipolis and those patriotic, civic, and educational organizations to observe the week of May 15 as National Peace Officers Memorial Week with appropriate ceremonies and observances in which all may join in commemorating law enforcement officers, past and present who have given of themselves for the good of others.